Hey!! I am back with another recipe for our Christmas Series!! 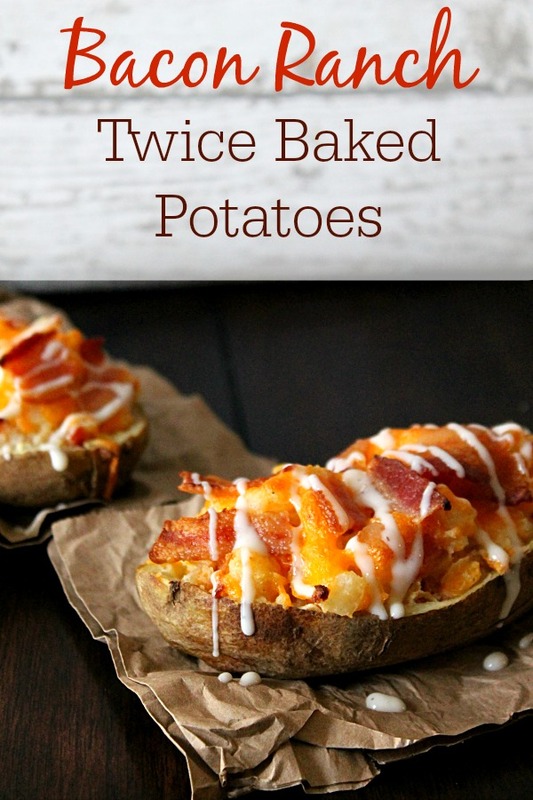 Now we always have a large decadent Christmas Eve meal, sometimes turkey and ham and sometimes prime rib, and these Bacon Ranch Twice Baked Potatoes make the perfect side for any holiday meal. These potatoes are so simple to make and really don’t require a lot of ingredients but they are still bursting with flavor and just the perfect thing to add a little something different to the table. Can I just say that these Bacon Ranch Potatoes are delicious, cheddar cheese and crispy bacon all mixed together with fluffy potato, butter and then you get that pop of ranch flavor that seasons the potatoes perfectly! You know what else rocks about this recipe? You can make the night before and pop these bad boys in the fridge and just give em their second bake right before dinner, easy peasy! Plus there’s bacon and that is an automatic win for any recipe! Bake or microwave the potato until cooked through. Let cool until able to handle. Slice the potato in halve. Gently scoop out the potatos leaving just the skin and little potato for stability. 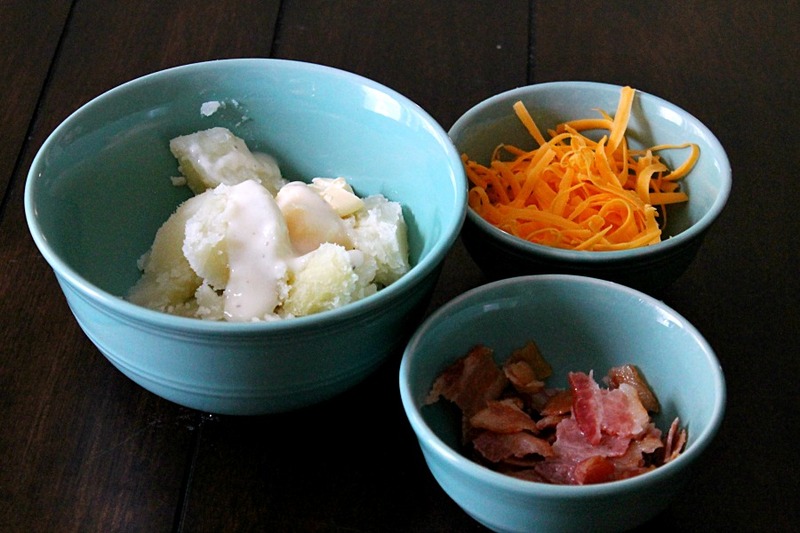 Mix the scooped potato with the butter, ranch, bacon, most of the cheese, salt and pepper. Fill the potato skins with the potato bacon mixture. Top the potatoes with a little extra cheese and bake at 350 for 15-20 minutes until the cheese is melted and potatoes are warmed through. 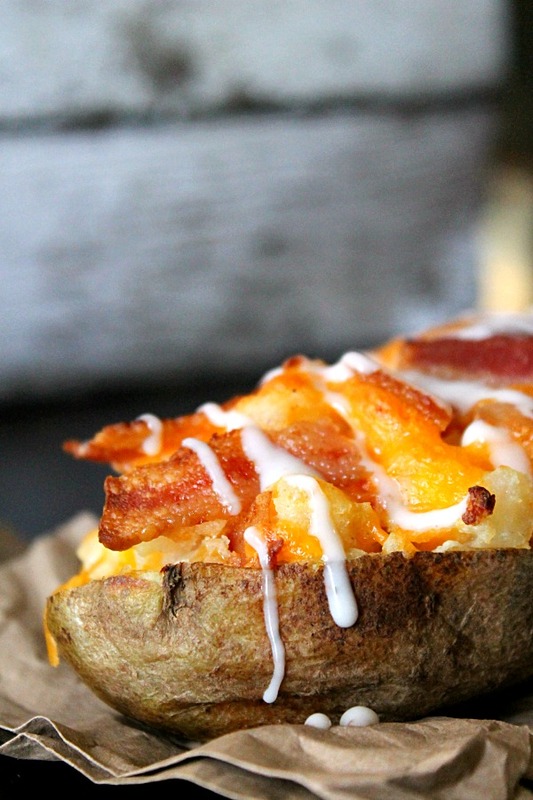 Drizzle potatoes with a little extra ranch and serve! I hope these potatoes end up on your holiday menu this season!! Speaking of which, what are some of your favorite holiday sides? Don’t forget to head on over to Dana’s and check out her Classic Macaroni and Cheese, yum!! You can follow me on Pinterest for even more yummy inspiration! YUM! 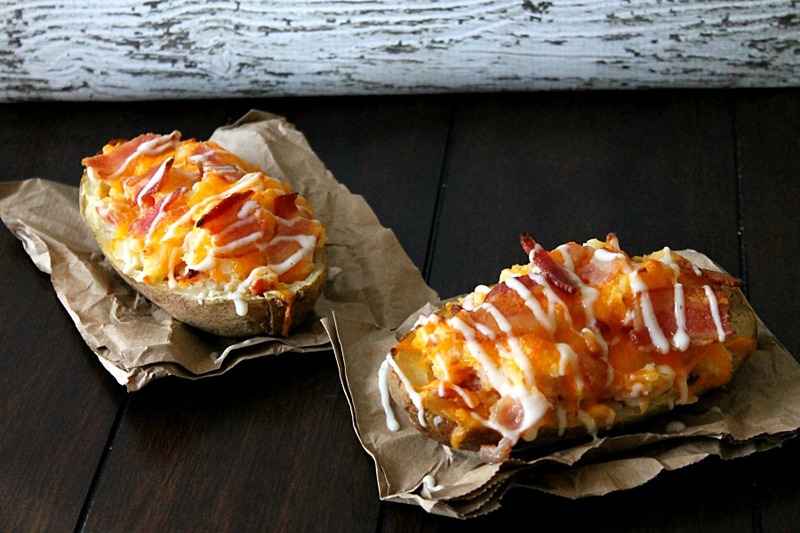 These take baked potatoes to a whole new level! You really can’t go wrong with Ranch dressing or bacon either. Pinning! Mmmmmm….looks delicious! Now I know what I will be fixing for dinner! Thanks for the amazing recipe! Pinned! These look so amazing! Ranch goes with everything! These look amazing! I’m going to have to try them out. Thanks for sharing! You had me at bacon and then sealed the deal with ranch! YUM!!! PINNED! Happy Thanksgiving! Can’t go wrong with those 2 lol! Thanks for stopping by! Stopping by from SITS share fest! 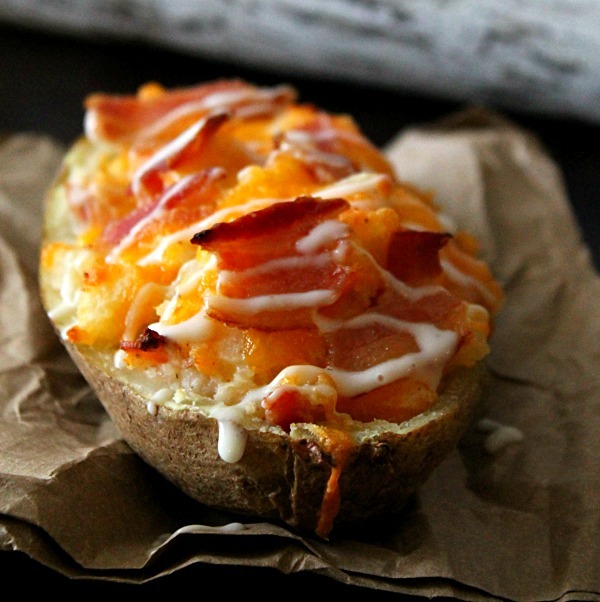 not only do these potatoes look good and have one of my favorite things-bacon!! but all your food pics are great and look yummy! I pinned this one and started following you on pinterest! Thank you so much for stopping by! Looking forward to following you back on Pinterest!